When reading the post of my fellow MVP Luc van Vugt I was feeling like ‘Ah, that’s very familiar’. He was struggling with installing two versions of the NAV Help Server side by side. And apparently, when looking at his screenshots, the installed NAV Web Client wasn’t installed correctly either. The default port for these web components haven’t changed between releases, so if you install it without changing the configuration you will end up with web sites that use the same port number. And that is simply not possible with IIS. Well, at least not possible without some more configuration. I’ll come to that later in this post. 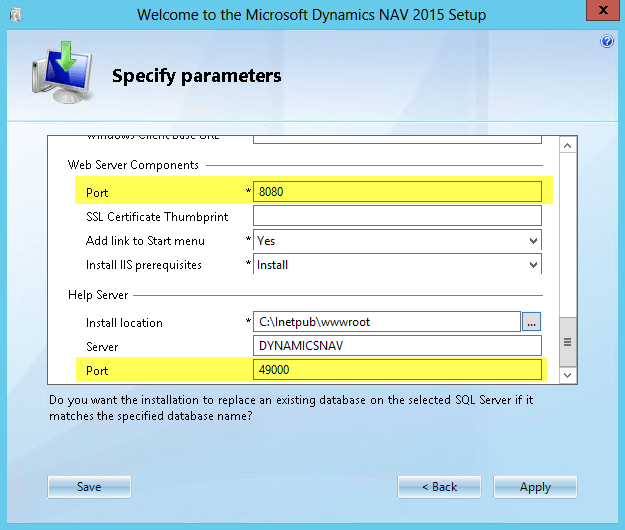 After a clean installation of NAV 2013 R2 and NAV 2015 and without changing anything in the configuration, IIS shows that two sites couldn’t be started. 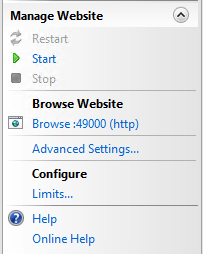 You can try to start the web site by selecting it and click on Start under Manage Website at the right hand side. The most logical thing is now to change the port number of one of the web sites. How to do this? 2. 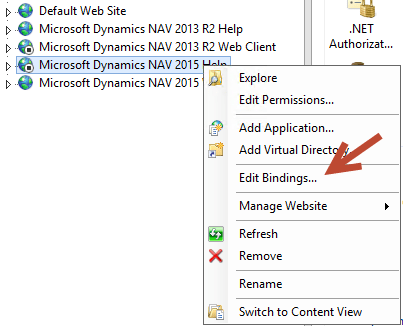 Select the web site and click on Bindings under Edit Site at the right hand side. 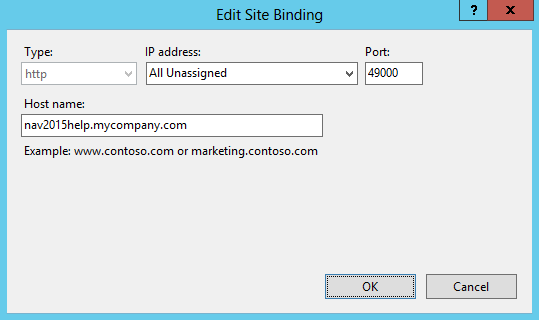 Select the binding, click on Edit and change the port number (e.g. 49001 instead of 49000). Click on OK and Close to apply the modified binding to the web site. It’s that simple! Now I want to mention some alternatives. The first thing I want to mention, is the possibility to change the port number during installation. If you are going to install the web components side by side, you should notice before and choose what port number each web site will run on. The config files will be changed accordingly, so no need to change them afterwards. The second one is a bit more complicated. But it is an option you should consider, it has some advantage. I’m talking about using aliases, in other words, changing the host name of the web site. 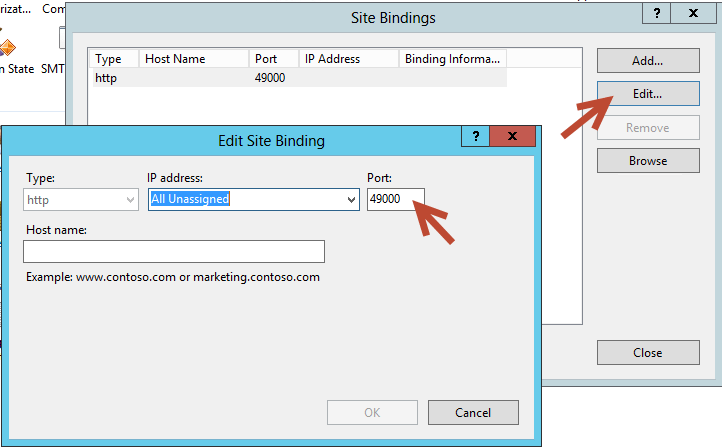 The combination of host name and port number must be unique. Each request from a browser to the web server contains the host name and port number, so IIS can determine which web site will respond to that request. But wait, a server has a unique IP address, but what about the alias? How can we add an alias to a server name so the browser knows the IP address where the request must be send to? The first DNS record is then an A record, which maps a server name directly to a static IP address. The other records are CNAME records which defines the alias for a server name. And last, but for sure not least, it becomes possible to move the NAV web components to a different server without changing the URL. Only the CNAME record changes and users will not even notice it. Thanks for sharing. In my opinion, if you use host headers, you can bind them to the same IP and port number. So it simplifies for the user, not to learn the port number, just the hostname with the base URL :-).